In a career spanning more than seven decades, until 2013, Sidney Forrest was one of the nation's most recognized clarinet virtuosos. Born in 1918, Sidney Forrest was awarded a scholarship at a young age from the New York Philharmonic to study with its renowned solo clarinetist, Simeon Bellison. He subsequently studied with Bellison at the Juilliard School, and also attended the University of Miami and Columbia University. In addition to Bellison, he studied with Alexander Williams, principal clarinetist of the NBC Symphony under Toscanini and Otto Conrad, principal clarinetist of Berlin Philharmonic. Mr. Forrest began his professional performing career in Washington, DC, as clarinet soloist with the prestigious United States Marine Band (the President's own) through the entirety of World War II. Immediately afterwards, at age 26, he became principal clarinetist of the National Symphony Orchestra, professor of clarinet at the Peabody Conservatory in Baltimore, and established an enviable career as an acclaimed clarinet soloist and chamber artist. Among his numerous recordings, his landmark renditions of Berg's Four Pieces, Weber's Gran Duo Concertante, Hindemith's Sonata and Mozart's Quintet in A major (with the Galimir String Quartet), and the Brahms Trio (with Bernard Greenhouse and Erno Balogh) are still highly prized. 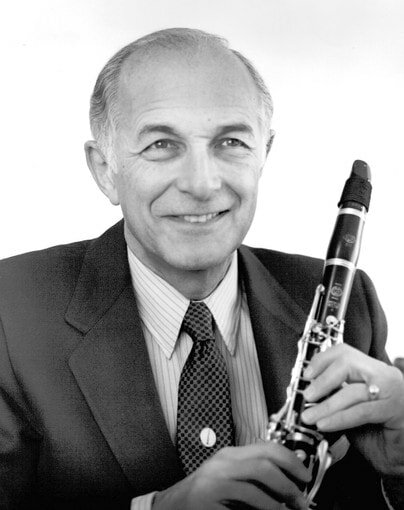 As a highly respected teacher, Sidney Forrest was most notably professor of clarinet at Peabody Conservatory of Johns Hopkins University from 1946 to 1985. And for 45 summers (1959–2004) he was a member of the faculty at the Interlochen Center for the Arts. He also taught for 50 years at the Catholic University of America, and served on the faculty of American University. As evidence of his success, his former students have taken major orchestral positions in Los Angeles, New York, San Francisco, Boston, Cincinnati, Columbus, Baltimore, Memphis, Stuttgart, London, and Paris. Numerous solo and chamber performances took place at such venues as the Library of Congress, the Phillips Collection, and the National Gallery in Washington, as well as many other places throughout the country. One very special occasion was when he performed Copland's landmark Clarinet Concerto with the composer as conductor, at the Pan American Union in Washington. Mr. Forrest was also a respected clinician/adjudicator, judging and presenting master classes throughout this country and in Canada, and serving as a juror for the United States Fulbright Commission. He published numerous arrangements of music for the clarinet, and regularly contributed articles for various woodwind journals. He was actively teaching until his death just before his 95th birthday.